Eternal Players, Welcome to Paris! 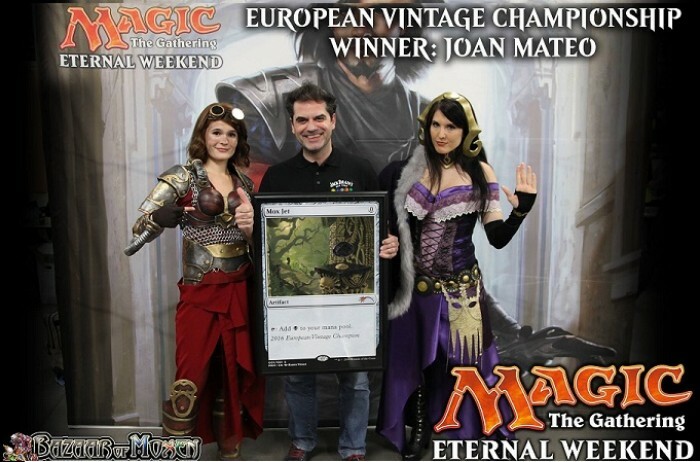 Bazaar of Moxen is pleased to announce the organization of the second Eternal Week-end (ETW) in Europe in collaboration with Wizards of the Coast! Eternal Week-end is THE week-end that gathers the whole Eternal community. The fun will kick off on Friday, with people will be able to do the final adjustments to their decks while playing Eternal side events and Trials. 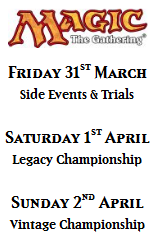 On Saturday, we will host the Legacy championship. On Sunday the Vintage championship. The winners of these two awesome events will have the honor to be European Champions! On top of this exciting title, the winners will win a unique oversized card of a staple of the format. Also, to make Eternal week-end an even more exciting event, every player playing in a Championship will receive an exclusive official play mat featuring another format staple! There will be two: One for Legacy and one for Vintage! Throughout the week-end, we'll be able to offer the exciting and super-demanded Chaos Draft and Modern Masters 2017 side events. More details concerning these vents will be communicate very soon. So be ready and save the date for this event happening from 31st of March to 2nd of April 2017 at Espace Charenton, 327, rue de Charenton 75012, inside the beautiful Paris. Registration will open soon. Stay tuned for details!